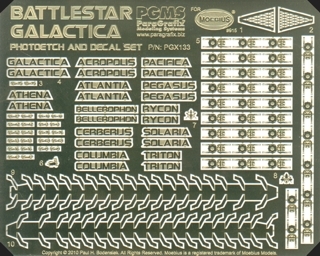 Update the new Battlestar Galactica model from Moebius Models. Series correct raised lettering for the ship's nameplate & registry numbers. Decals for the nameplate to eliminate the need for delicate painting. Nameplates, registry numbers, and decals for the other 11 Battlestars (using names from the original 1970s program). Museum windows for the starboard flight deck. Easy-fold girders for the flight decks to add extra realism. BONUS: Three in-scale copies of Colonial One to fit in the flight deck let you decide how you'd like it displayed. Watch this video to see how easy it is to fold up the ribs for the flight deck interior.